​For the people we support, a home is far more than shelter. 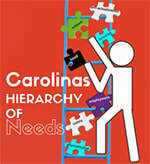 ​​The mission of Carolinas Hierarchy of Needs is to provide affordable supportive housing and resources to individuals so that they may become independent. Our programs are designed for chronically homeless people specifically veterans, disengaged youth, and individuals with special needs. The goal of CHON is to partner with local, state, and national agencies and organizations to provide the best evidenced based practices for an effective transitional pathway to success and a better quality of life. The services include a holistic collaborative approach that address the need of the individual: affordable housing, medical home care, supportive services, educational and career resources and health-care management. At CHON our motto is “Building People's Lives Today for a Brighter Tomorrow."